Open floor plan, w a native rock fireplace, tongue and groove wood ceilings, maple hardwood floors. Dining room, Hickory kitchen with propane range, and an island prep station, w counter seating. Office off kitchen. 2 bedrooms on both upper and lower walk out levels. 2 1/2 baths. 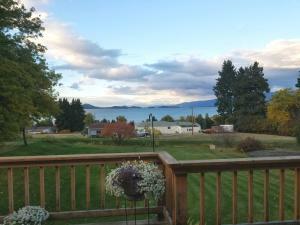 This location sports very nice lake and mountain views, with decks from which to entertain. The seasonal canal runs in the front yard, making a little stream, and saving money on water summer yard and garden watering expense.